Vocalisms includes 10 of my songs for soprano and piano, performed by Mary Mackenzie and Heidi Louise Williams. The album also features songs by John Harbison, Ned Rorem, and Daniel Crozier. You can find it at the Albany Records website, or Amazon. 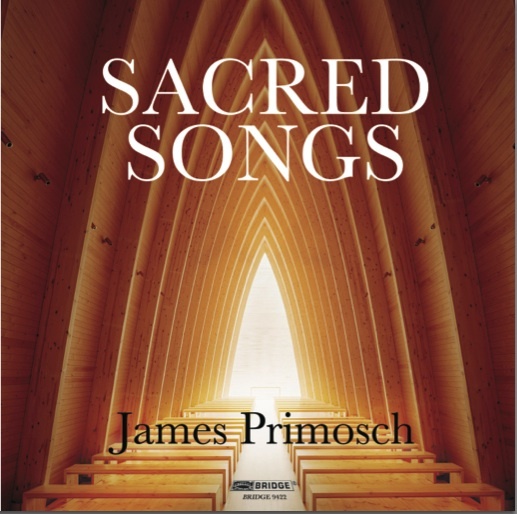 Sacred Songs is devoted to my music for voice and ensemble, and was released by Bridge Records. Susan Narucki and William Sharp are the soloists; Christopher Kendall conducts the 21st Century Consort. It’s available at Amazon and at Arkiv Music. A review by Christian B. Carey on the Musical America website is here; another is at Audiophile Audition, by Steven Ritter. Composer Daniel Asia discusses the album at the Huffington Post here. The March 27 Philadelphia Chamber Music society recital by Carolin Widmann, violin, and Gloria Chien was memorable for elegant Beethoven and Stravinsky, but especially for a hair-raising Prokofiev First Sonata and a spectacular little piece for unaccompanied violin by Widman’s brother, Jorg. It was a kind of fantasy (a “Paraphrase”, as the title put it) on the Wedding March from Midsummer Night’s Dream by Mendelssohn. From the opening triplet – played by tapping on the body of the violin – to the witty harmonic detours and hairpin turns, this was brilliantly composed and played. The piece is not just a virtuoso turn, but also a piece about virtuosity. Jason Wirth and Lily Arbisser did a wonderful job with songs from my cycle Holy the Firm at a program in Manhattan last week. Lily sang with uncommon passion, and the result was a powerfully touching performance. Jason partnered her beautifully, with alert and sensitive pianism. This past Sunday Mimi Stillman’s Dolce Suono Ensemble presented a big program featuring important and neglected American repertoire, ranging from the Piston Flute Sonata (flutists, please program the Piston instead of playing the Poulenc or Prokofiev sonatas yet again!) to Richard Wernick’s piano suite called Pieces of Eight. Violinist Miranda Cuckson dazzled in an unaccompanied work by Ralph Shapey. Indeed, the performances were uniformly excellent. Every one of these composers richly deserves a more prominent place on our concert programs. There was more Wernick at last night’s concert by the Daedalus Quartet with James Austin Smith, oboe and Michael Rusinek, clarinet, as well as works by my Penn colleague Anna Weesner, Penn alum Philip Maneval, and myself. James and members of the Daedalus played my Oboe Quartet with a keen grasp of the work’s varied moods, clearly enjoying the jazzy moments in the last movement. Last fall, The Crossing giving the first performance of my Marilynne Robinson setting, Carthage. You can hear the concert that includes my piece on WRTI- 90.1 FM this coming Sunday, March 3 at 4 pm. Access WRTI’s webstream on their homepage. More information here. I’m grateful for two recent performances that I traveled to hear: Matins was done by Peggy Pearson, oboe, and the Cantata Singers, conducted by David Hoose, in Boston’s Jordan Hall; A Sibyl was performed at the opening concert of the Florida State University Festival of New Music. The orchestra sounded fabulous as did pianist Martin Helmchen. The Saariaho was consistent with my impressions of much of her work – very beautiful and a little too static for my taste. The Sibelius symphonies continue to baffle me and doing two in a row didn’t help much. The famous acoustics of Symphony Hall actually seemed to me to be a little too rich – good for the Saariaho and Sibelius, but a little blurry for the Mozart. I lingered in Boston to attend an Emmanuel Music celebration of John Harbison’s 80th birthday. It was good to have another chance to hear his Sixth Quartet, and the evening also included a set of John’s pop songs, with the composer at the piano. In Florida, the featured guest composer was Georg Friedrich Haas, and I heard a number of his pieces throughout the festival. The music struck me as uneven, severe at times and sensuous at others, a strange mix of fascinating and dull. My own work, the song cycle A Sibyl was performed by soprano Marcía Porter, and and ensemble of faculty and grad students, with Alexander Jiménez conducting. One festival highlight was a concert by the Meitar Ensemble – guests visiting from Israel – who offered a blazing performance of Grisey’s Talea among other works. I’m grateful to all who made these performances of my music possible. Next on the schedule is a premiere with the Imani Winds, on February 15 in Philadelphia. So you need even more to see and hear?